The silencing of women in Hip Hop goes beyond radio spins, extending to the 5th element, Knowledge. Like the Black Panther Party before it, the Hip Hop as Knowledge movement has been largely driven by women, yet the faces given the most exposure and the voices given the largest platforms are overwhelmingly male. This is particularly true when we examine the paradigm shifts bringing Hip Hop to therapeutic and academic spaces. While the decade long debate shaming the invisibility of women in rap rages on, I can no longer sit silently ignoring this other side of invisibility. Why is it that women consistently support Hip Hop events, blogs, chats, conferences, and webinars that often fail to give us the shine we deserve? 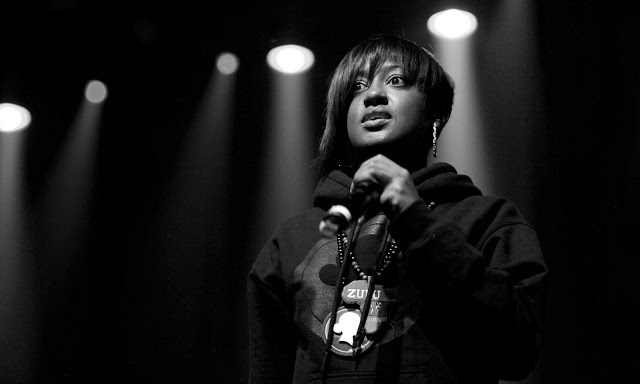 Although women have been part of this movement since its inception, we are often an afterthought, unless it happens to be Women’s History Month or the topic is “Women in Hip Hop”. Today I challenge my Hip Hop sisters to rise up and be heard. Cheering from the sidelines, when we are actually writing and executing the plays only ensures our invisibility will continue. Let’s support each other, and embrace our power. It’s time to move boldly without apology. As Fannie Lou Hamer stated, “You can pray until you faint, but unless you get up and try something God is not going to put it in your lap.” The acknowledgement we deserve will not be given, history has shown us that. We must claim the space we’re already filling or give it away to the next man. The choice is ours. We are the soul of Hip Hop, and have been at the center of our culture’s evolution from the beginning. Let us be bold like Mother Fannie and demand our space within the culture. If not for us, let’s prepare a place for our daughters. Through Hip Hop’s 5th element, it is time to make our presence felt. No more asking. Dr. Adia Winfrey is an author and clinical psychologist who has been featured on NPR, the Tom Joyner Morning Show, and in JET Magazine. She is the founder of Healing Young People thru Empowerment (H.Y.P.E.). H.Y.P.E. incorporates Hip Hop music and lyrics into group therapy sessions for at-risk youth. Learn more about Dr. Winfrey and H.Y.P.E. at www.letsgethype.com.